How Much Will Your Vehicle Wrap Cost You? This is a question we are asked every day. It’s not necessarily an easy answer. We have the one that nobody likes to hear, “It depends on a whole bunch of things.” If you keep reading this helpful post, you will benefit from some insights into how vehicle wrap costs are calculated and the answer that is right for your specific vehicle wrap project. 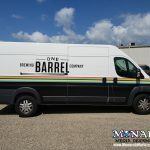 There are a lot of differences in design, types of vehicles, materials requirements and complexity of installations, but the basic building blocks for a vehicle wrap always remain the same. 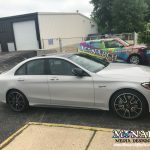 Read on and you will learn why it’s important to watch out for vehicle wrap companies that can beat everyone’s price. Do they have the same quality? Are they using the same materials? Are they a 3M Certified Graphics Installation Company? If they are not asking you about your customers, asking for high-quality artwork, wanting to get measurements of your vehicle and photos if the vehicle cannot be brought in…they they might be cutting corners. At Monarch Media Designs, we always take a handful of things into account when calculating the cost of your vehicle wrap. The vehicle wrap design is one of the most essential parts of the process. We cost out this step separately because complexity and factors influencing designs can vary significantly. Additionally, knowing the final design is necessary to determine the price of a particular wrap. These are a few of the factors that influence the cost of the design. 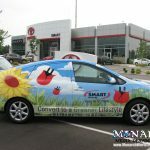 Production costs involve the cost of the specific materials required for the wrap and the labor involved in printing, laminating, and cutting the vinyl. 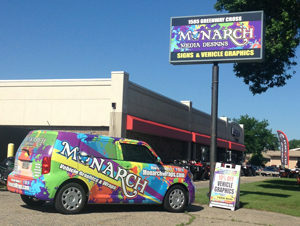 At Monarch, we only use brand name vinyls, specifically 3M. We do not cut corners using private label or discounted materials. By using brand name vinyls we can stand behind the quality and pass the manufacturers warranty on to you. IMPORTANT – not all brand name vinyls meet vehicle wrap standards. Be sure your wrap company is not only using a brand name vinyl but a premium CAST long term vinyl designed specifically for vehicle wraps. Square footage of the area to be printed and/or installed. Installation costs will vary by type of vehicle. 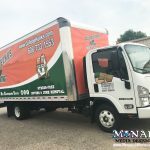 For example, a small vehicle with complex curves like a PT Cruiser, Mini Cooper or Volkswagen Beetle can require significantly more time for installation than a large box truck or trailer with large flat surfaces. Listed below are some of the items we take into account when estimating installation charges. The paint and surface conditions that the wrap material will be applied to. Estimates also take into account rivets, screws, corrugations, and accessories like door handles. spoilers or trim that need removing and re-installing. The complexity of the compound curves to be wrapped. A flat surface is a much different application than the spoiler and bumper of a car. 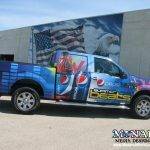 Including the design, it’s typical to see the fabrication and installation of full vehicle wraps can have varying prices depending upon the factors listed above. 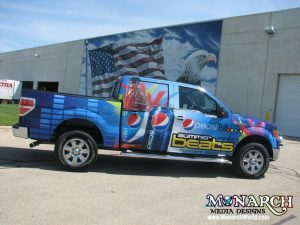 Keep in mind, a full wrap isn’t always necessary to accomplish what you’re trying to do with vehicle advertising. Partial vehicle wraps can be a great option to consider. Partial wraps often include the sides or the sides and back of a vehicle. Partial wraps can still be extremely effective from a visual and marketing perspective. You can also consider full color cut decals and cut vinyl lettering. The goals should be to get your vehicle advertising working for you – we’ll help you work within your budget! Ready to get specific about your wrap project? Stop into our shop today, or fill out our contact form.